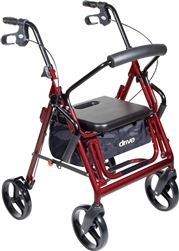 Seat size: 19"W x 16"D - Seat height: 19"
The Nitro Duet's winning design feature is the ease by which the user can transform the unit from a rollator to a transport chair. 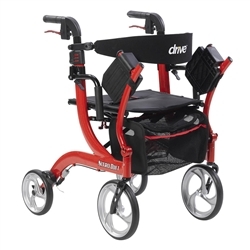 This rollator/transport chair is constructed with the exceptional detail for powerful control, effortless mobility, eye-catching style and innovative functionality. 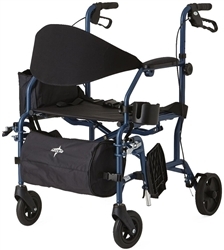 The Transport Chair - Rollator Combo Units feature a footrest that folds down when used as a transport chair and folds up when being used as a walker or rollator. 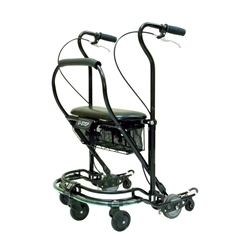 This gives the patient the best parts of a rollator and a transport wheelchair, with the ability to sit comfortably or walk when needed. Should you need assistance in choosing a model, or trained staff is a phone call away at 866-218-0902.